Leading Exporter of spans from Mumbai. We offer Spans. 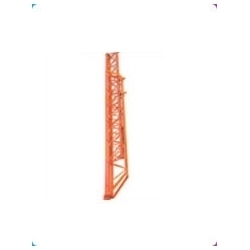 They are an integral structural construction scaffolding components of a construction scaffold, providing support to the overall structure. They can be adjusted as per the need and are basically used to support floor forms while laying slabs. These are the most advanced telescopic centering systems that basically used to support floor forms while laying slabs. This versatile system can easily be used and erected by unskilled labour. It virtually eliminates vertical propping and permits free space beneath the spans. Spans comprise of an inner and an outer lattice members as illustrated. A combination of inner and outer lattice members of sizes indicated below can bridge spans as small as 1892 mm to as. large as 5510 mm. On having decided the combination of lattice members best suited to give the required span and the size of the floor form, the lattice members are telescoped to achieve the required span and locked into position by means of the 'I' bolts provided at ends of the outer lattice member.